Spring has officially sprung in South Korea. The cherry blossom trees are blooming, the weather is heating up – I had to turn on my A/C the other day for the first time, and the mini skirts have surfaced. Similar to North America, wedding season is beginning to ramp up into full swing. A few weeks ago I arrived to work to find an envelope on my desk inviting my to one of my Korean coworkers wedding. 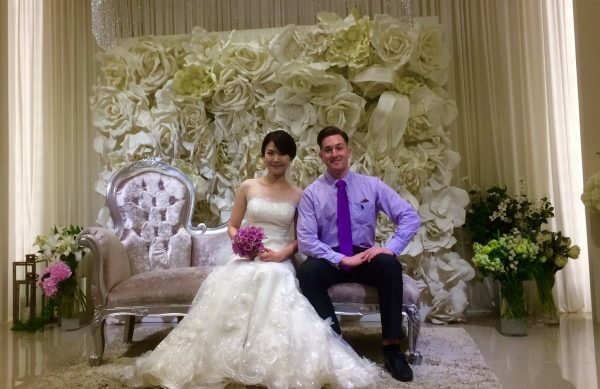 I was excited because I’d never been to a wedding out here, and many other foreigners have spoken about going to one or two. Also I was happy to see that the envelope didn’t contain a notice of termination. I hadn’t heard too much regarding what all went on at them. One teacher mentioned a buffet – which I am always game for. And knowing how much Korean hit the booze, I figured I was in for quite the show. Well yesterday, the special day finally arrived. I got my hair trimmed up, put on a tie for the first time since being out here and loaded a wedding card up with some wons – Korean currency – for a gift. Off I went. 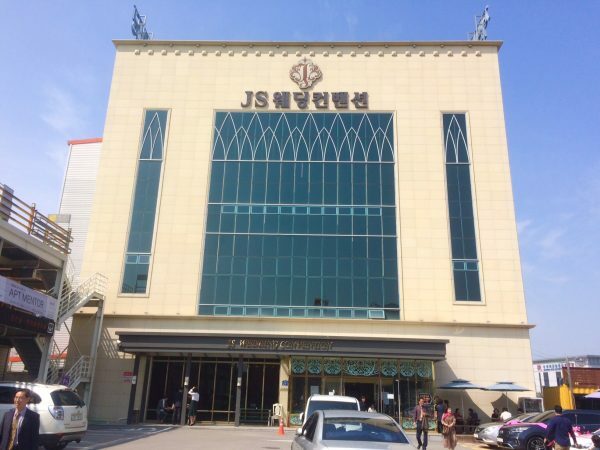 The venue was in a swanky area of Gwangju called Sangmu. Famous for shopping, and a higher class of bars and clubs. A up and coming neighborhood where later 20’s and early 30’s Koreans like to frequent. I procrastinated on asking my coworker the exact location, so gave the wedding card to a cab driver, hoping he’d know the spot. Lucky when we arrived it was evident which venue I was attending. We pulled into a convention centre style parking lot with multi large buildings touting wedding symbols. I guess this was marriage country. When I got out of my cab I recognized the name of one building from the wedding invitation and hobbled over to the entrance. Today was also the first day I was able to walk without the aid of and crutches, as I am recovering from a broken ankle. As I walked up to the venue there were tons of people in suits and traditional Korean clothing, called Hanboks. I quickly realized the wedding I was attending was not the only one happening that day. The building consisted of a few floors of banquet halls with buffets and tables, and one floor with a reception hall and the ceremony room. They were banging out marriages like hamburgers out of McDonalds. It made me think of what Vegas must be like, but classier. The whole building and hall was beautiful and elegant. After a few minutes of walking in and exploring the building looking for someone I worked with I knew I was going to be in for some confusion. I couldn’t find anyone and I had no idea where to go. Asking a few of the workers where to go was futile, naturally none spoke English. I guess I arrived too early. After about 20 minutes I spotted my co worker who was getting married walk in decked out in her dress. She was looking absolutely stunning for her day. She explained I had come a little early, but to go grab some food from the buffet. 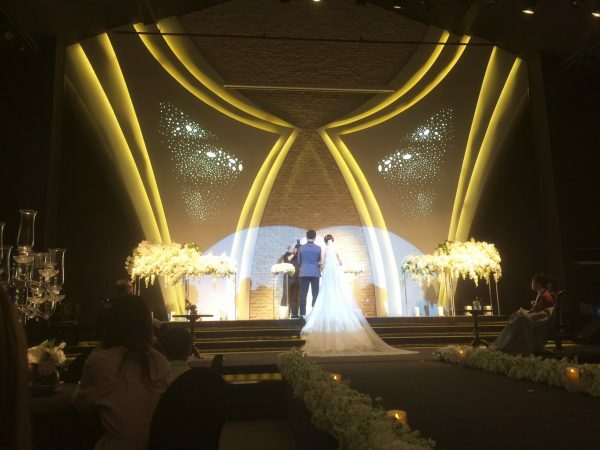 Now this is where Korean weddings take a point over North America. The amount and selection of food was outstanding. And a cooler full of ‘help yourself’ beer. Perfect! After a few beers and a few plates, I checked my phone and realized the ceremony would be starting soon. I headed back up and finally found a group of my co workers. Shortly after meeting with my colleagues, we found some seats and waited for the ceremony to start. Concert lights began to light up and the Groom entered on a sliding stage from the back end of the room, he was waving and bowing. There was a large catwalk from the back of the room to the front where they would be standing for the ceremony. Next came the bride from another sliding stage and was walked to the front of the room by her father. They got together at the front of the room and did some speeches and put on a bit of a performance with speaking and actions. Next they brought up the parents of the groom and bride, sitting them in chairs on either side of the couple, where the wedding party of best men and bridesmaids would normally stand. There was some bowing and hugging and the couple addressed each set of parents. Then they said their “I do’s” – at least I think, it was all in Korean which I can’t understand. After that a few people came up one at a time to sing to the newly wed couple. Followed by a slide show of old photos from both of the couples families. All in all, it seemed much more theatrical than North American weddings. The whole ceremony took about 45 minutes and then the couple took pictures. Different variations of themselves, the couple with their parents, immediate family, friends and then everyone. I ended up in one of the photos, and for some reason they placed me directly front and center beside the bride and groom. Now I had never met the groom, my co worker’s husband. Yet in one of the photos there I am standing right next to him as if I were his best man. I got a chance to speak with him briefly, nice guy. Wrap it up with some food..
After the photos we slowly made our way to the reception hall and then down to the buffet again for some more food. I definitely enjoy the emphasis placed on eating in this country. They don’t mess around with food. Still feeling stuffed from my previous plates, all I could fit in was another beer and some fruit. I’m regretting not eating more as I write this. I looked around at the table and noticed no one was drinking. They even questioned me at one point for drinking in the day. It was 4pm by this point! I was thinking, ‘Guy’s, I had a beer at noon today’. 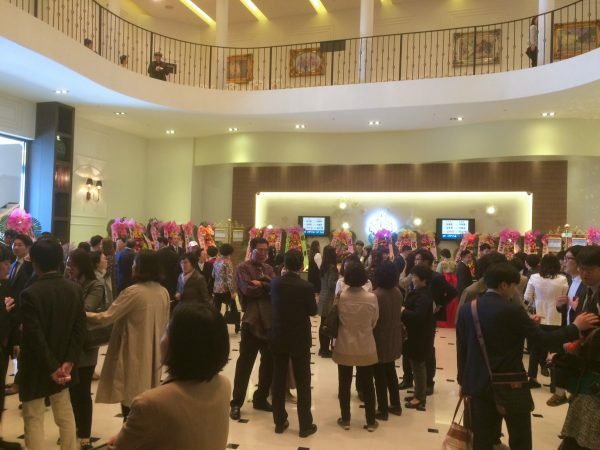 So Korean weddings lose a point for lack of party. After some food and my drink, everyone parted ways. The whole deal lasted about 2 hours. 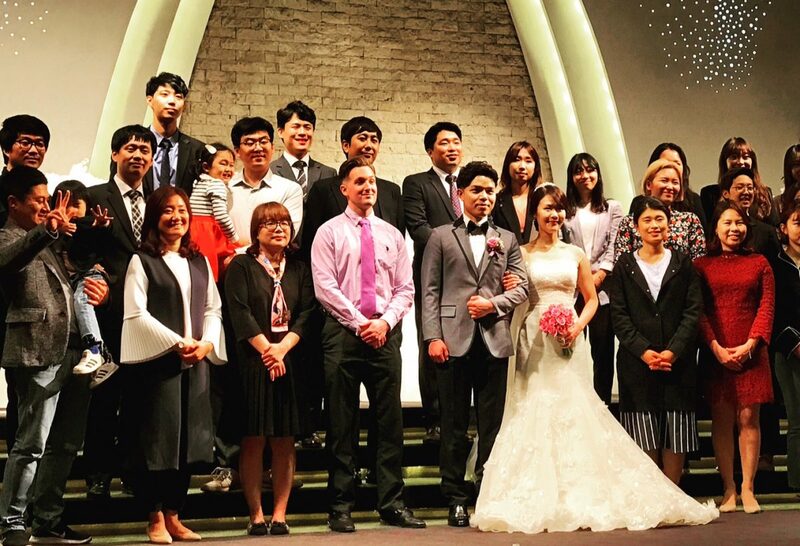 It was a beautiful wedding, and I guess they are just much leaner with their weddings than we are in North America. 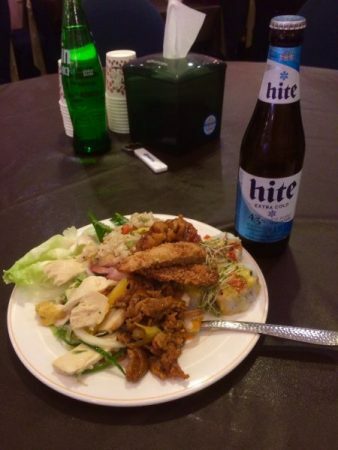 In summary, Korean weddings have better food. But North America throws a better party.